Summer’s right around the corner – although spring took its time getting here – and this year, it’s Nor-Shipping season. This issue has a strong offshore focus, as we take a look at aspects of the oil and gas industry from a maritime perspective. We include a profile of the Norwegian Shipowners’ Association Director, Sturla Henriksen, who has his finger on the maritime industry’s pulse. Norway is among the world’s largest maritime nations, and the NSA serves more than 160 companies, making Henriksen’s perspective one of the most complete. We also take a look as some of the highlights you can expect during Nor-Shipping, which is, without a doubt, the most exciting maritime event week. With high-level conferences, a top-quality exhibition, and prime networking opportunities, expect to meet the cream of the international maritime industry in Oslo this June. Included in our Nor-Shipping focus are features that look at shipbuilding, crew transfer, dynamic positioning as well as satellite communications and condition monitoring – all of which having an oil and gas perspective as well. Nor-Shipping is a good reminder of how technologies converge and inspire each other. But we haven’t forgotten oil and gas related topics. From Churchill Drilling Tools, we hear about rigid metal darts for downhole activation by the drilling industry, a mechanical extrusion technology that is used to improve cycling and control of a range of processes and devices. Petrotechnics explains how their Proscient software system enables companies to improve operational performance by optimising safe and efficient production and minimising or mitigating potential impacts to production. From a market perspective, we hear from two important market analysts. One perspective, co-authored by the London Section of SPE and FirstEnergy Capital provides their take on how to manage oil and gas portfolios in light of the current instability. Triple Point Technology provides more insight into managing market volatility, explaining that mitigating risks with the use of an advanced Commodity Management solution is imperative for any firm that plans on a long-term future. In addition, we have a subsea hardware market forecast from Douglas-Westwood. The long-term growth potential for this market is good – very good – with growth expected in every basin across the globe. And these are only the highlights – you’ll find much more as you flip through the pages of this issue. We also look at some of the highlights of this year’s Offshore Technology Conference in Houston. This year was Norway’s 40th year at OTC, which was celebrated at the event by royalty, ministers and other dignitaries from the industry. 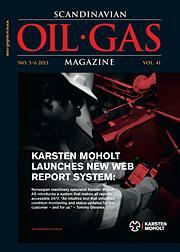 And don’t forget that we too are celebrating our 40th year of publishing Scandinavian Oil-Gas Magazine. And just a reminder – we’re planning to do our celebrating in the year’s final issue. If you have something you’d like include, whether as part of the celebration or in any other of the year’s issues, please be in touch. We’re looking forward to hearing from you.